Sometimes in life a happenstance event leads to a profound discovery. My uncle died fighting on Iwo Jima in 1945, and a recent purchase led to a link to that fateful event. John Joseph Vitanyi, my father's brother, was born in New Jersey on July 27, 1926 and thus turned 18 just in time to join the U.S. Marine Corps in the final months of World War Two. Growing up I had always heard that my uncle died on Iwo Jima, and my grandmother once showed me his Purple Heart, and a letter from a comrade that described how he was shot in the head by a sniper. I recall being told that he was a big man, at six feet four inches, and that because of this he carried a machine gun for his unit. That was the extent of my knowledge of the matter. My father, eight years his junior, did not volunteer anything more, if he knew it. For years I had a curiosity about my uncle's role on Iwo Jima, but had never investigated further. Recently while shopping in Ollie's, a local discount store in Erie, Pennsylvania, I came upon the book Iwo Jima, by Eric Hammel. It has lots of pictures, all black and white, and describes the campaign in some detail. Given my family's history, I purchased the book. It sat at home, unread, for several months. One day I happened to open it and noticed that it was pretty specific about unit designations, such as this battalion or that regiment. It made me think about my uncle, but I didn't know which specific unit he had served with. Fortunately my cousin, John Longmuir, the son of my uncle's sister, maintains a memorial web site that includes my uncle's unit information. 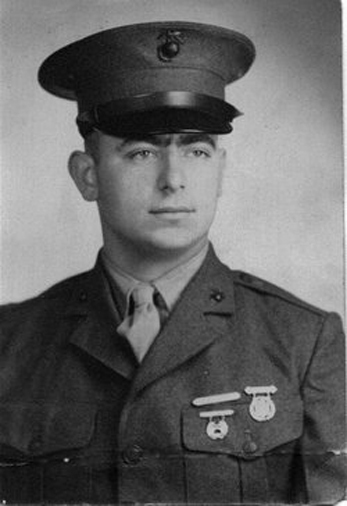 John Joseph Vitanyi died on Iwo Jima on March 13, 1945. 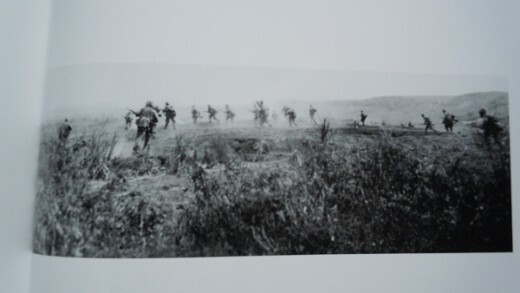 His unit was F Company, 2nd Battalion, 26th Regiment, 5th Division, United States Marine Corps. With this information in hand, I looked at the book with greater scrutiny, hoping to find some mention of where his unit had served. 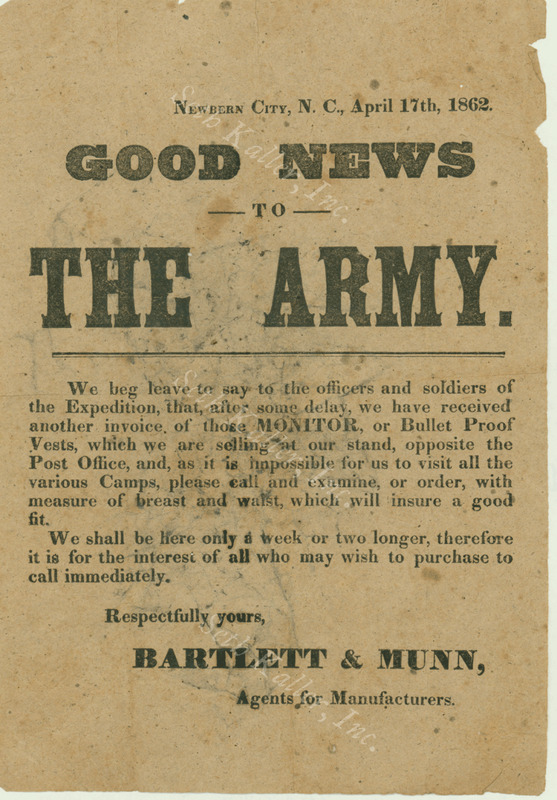 My hope was to perhaps find some mention of at least his regiment, which would consist of a few thousand men and could give me a better historical context. 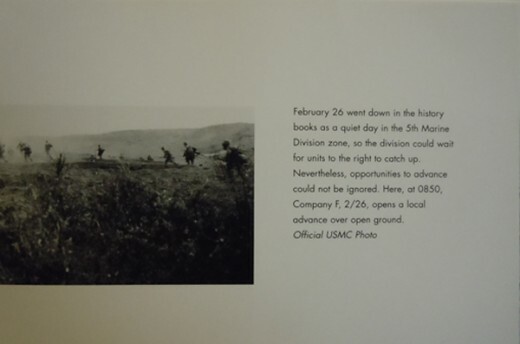 Imagine my surprise when I turned to page 185 and saw two photographs of an advancing Company of Marine infantry, with a caption indicating they were F Company, 2nd Battalion, 26th Regiment, 5th Division, United States Marine Corps. My uncle's Company! 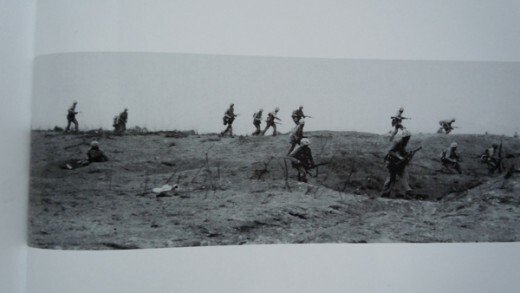 The caption below clearly identifies the advancing unit. A Company normally consists of around 250 men. 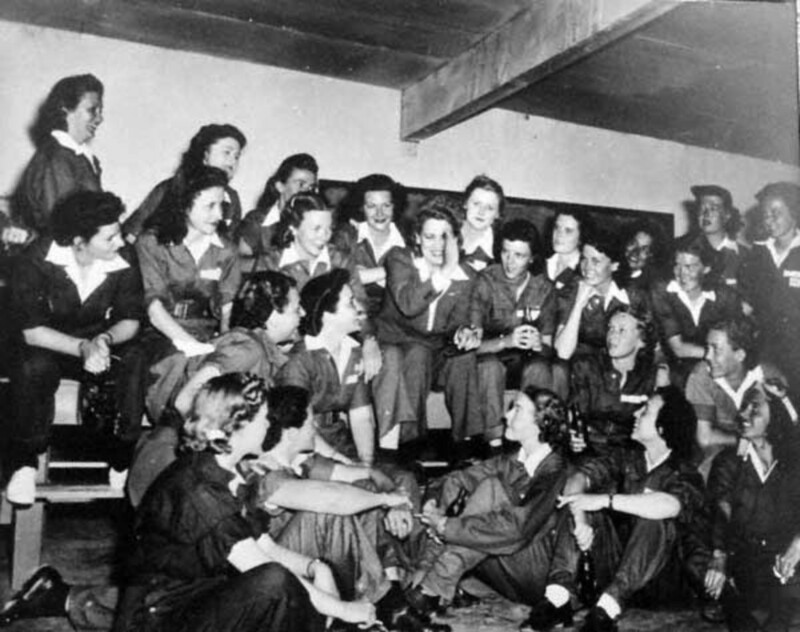 By the date of the photo, which was February 26, 1945, two weeks before my uncle's demise, F Company was much smaller from attrition. 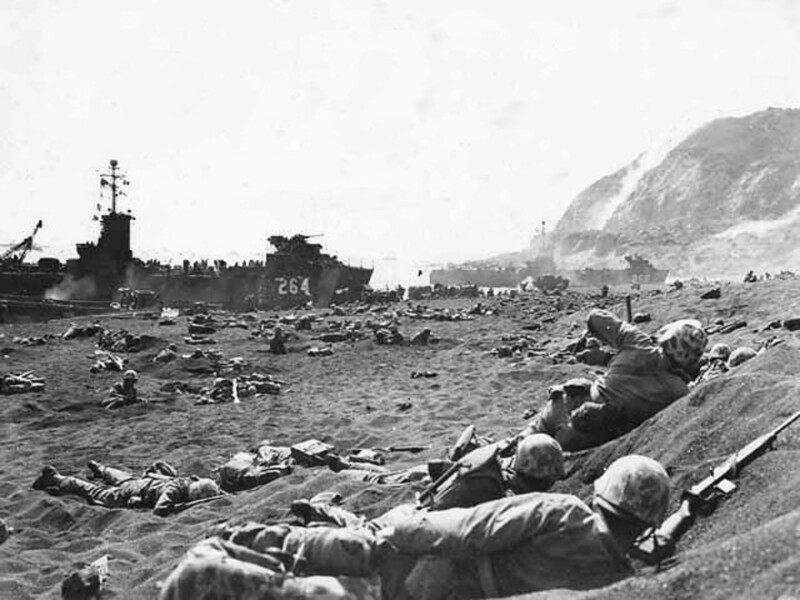 Here was a photograph of those men, my uncle's Marine Company, advancing under fire on Iwo Jima. At this point in time he was certainly with the Company, as his death occurred later. He may even be in one of the photos, although it is difficult to make out individual features. Whether he is in the photo or not, the marines pictured were his comrades, and they certainly knew him, fought alongside him, bled with him. But the story doesn't end there. After this discovery, I continued to look through the book, and came to a page about another Marine, Private Franklin E. Sigler. 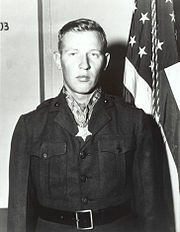 The book describes Sigler's Medal of Honor, and the unbelievable actions he performed which led to its issue. 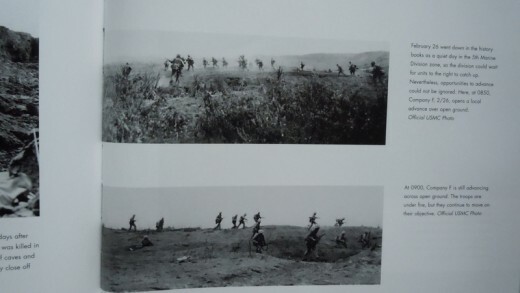 Near the end of the battle, with the Japanese pushed to an increasingly small area, Sigler apparently went berserk, as he "fearlessly led a bold charge against an enemy gun installation that had held up the advance of his company for several days, and, reaching the position in advance of the others, assailed the emplacement with hand grenades and personally annihilated the entire crew. " Private Franklin E. Sigler was in F Company, 2nd Battalion, 26th Regiment, 5th Division—my uncle's Company. The action taken by Sigler occurred on March 14, 1945, one day after my uncle was killed, no doubt attacking the very gun installation that had held up their advance. Sigler, like my uncle, was from New Jersey. Two Privates in the same Marine Company from the same state no doubt knew each other. Both were sent to Hawaii prior to deployment to Iwo Jima, and given time aboard ship it is inconceivable that they did not know each other, and probably well. 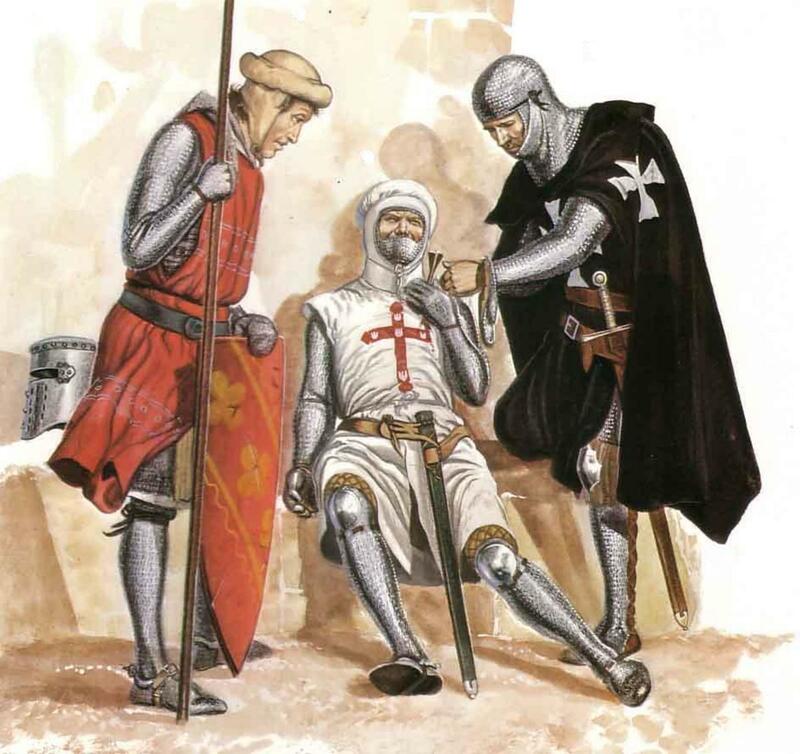 I wonder what influence my uncle may have had on him, either by his actions while alive, or in his death. F Company saw heavy action throughout the Iwo Jima campaign, and another of its members was George Edward Wahlen, a corpsman who also received a Medal of Honor for his actions. The medal was presented to him by President Harry S. Truman on October 5, 1945. Though he remained quiet about his experience for many years, in 2007 a book about him called The Quiet Hero: The Untold Medal of Honor Story of George E. Wahlen at the Battle for Iwo Jima was written by Gary W. Toyn. 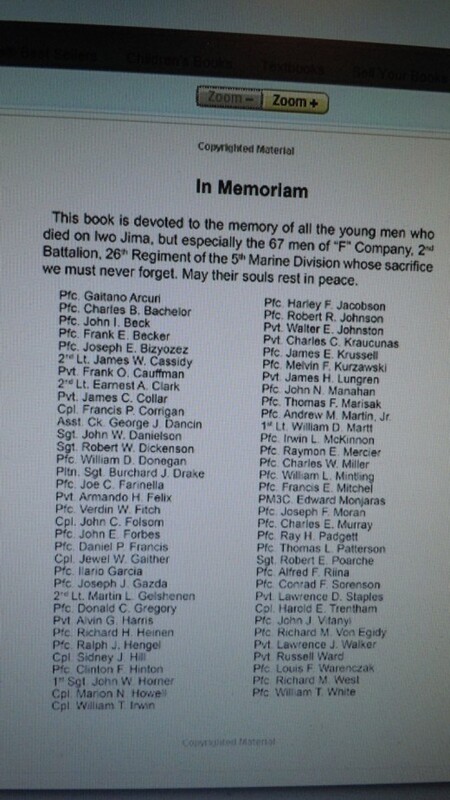 In the book, available on Amazon, specific dedication is made to the 67 members of F Company, 2nd Battalion, 26th Regiment, 5th Division, United States Marine Corps, who were killed on Iwo Jima. The 67 are listed in alphabetical order, including my uncle, John Joseph Vitanyi. As I look at the photos of those men advancing alongside my uncle under the most insane circumstances, history dissolves and is replaced by stern reality. Despite the intervening years and the dissolution of flesh and bone, John Vitanyi and his Company are now real to me. For that I thank the photographer who chanced to snap these photos, and who took the time to record the unit in question. 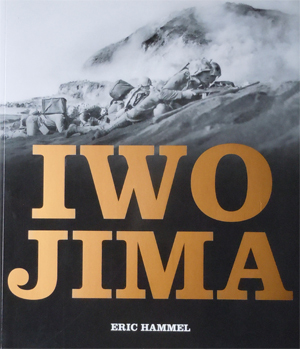 I also thank Eric Hammel for writing "Iwo Jima", without which I would not have encountered these photos, or had this experience. In a footnote, and perhaps completing the circle of life, thirty-four years after my uncle's death I married a Japanese woman, whose father had served in the Japanese army in World War Two. We have a daughter and two sons, who I hope never see the horror of war. I wish I could have met my Uncle John, but will have to simply remain grateful for his sacrifice and that of all the others. He is in good company. May he rest in peace. What an amazing story! Truly amazing facts uncovered rather by accident have proved this to be an interested read. Thanks for the feedback, RonElFran. And by the way, I lived in Mechanicsburg, Pa from 1994 - 1998, on Hill Lane. Small world. Great story. I enjoyed reading it. And what a privilege to be able to uncover all these links to your uncle.